Angela's opened it's doors in August 2017 situated in the seaside town of Margate in Kent the setting for Dreamland, one of the UK's oldest surviving amusement parks, as well as the modern Turner Contemporary Art Gallery. Situated on The Parade, the seafood restaurant just steps from the sandy beach and harbour was the first UK restaurant to receive the Best for Sustainability Award for 2019, from The Good Food Guide by Waitrose & Partners. Inside the narrow room has a pared back style, with bare walls, studded banquette seating and bentwood chairs set against small square tables made from recycled plastic bags. Water is served in salvaged milk bottles and a window to the open kitchen shows the chefs at work. Head chef is Rob Cooper and he prepares a daily changing blackboard menu to showcase the finest of the day's catch from Hastings fishing-boats and only uses fish that is MSC-certified. The restaurant also works closely with the Windmill Garden in Margate, ensuring that all of the kitchen and dining room's waste is composted in the community garden there. To complete the circle fruit and vegetables grown in the garden find their way back to the kitchen. Lift anchor with scallops, pumpkin and hazelnuts before moving on to a main course of turbot on-the-bone with hollandaise or cod, clams and parsley. Old favourites such as English trifle or chocolate tart round things off nicely. The wine list highlights English bins, gins come from Wales and Chatham and speciality teas and coffee are bought from companies based in Margate. 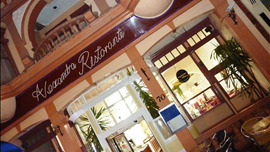 Overlooking Ramsgate's picturesque harbour, Alexandra Ristorante Italiano has been loyally serving its customers for almost 25 years but now a remarkable change has taken place.